I am very excited to tell you about my Rovos Rail experience, a two night 3 day rail journey through South Africa. There is a lot to talk about, but I will stick to my main highlights of the trip. After just getting married we had the amazing opportunity for our mini moon to go on a Rovos Rail journey from Pretoria to Cape Town. 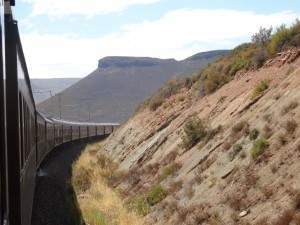 It was my first train journey and like other guests, I did not know what to expect and being from South Africa I thought that I have seen it all. 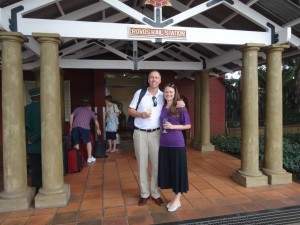 On arriving at the private Rovos Rail Train Station in Pretoria, we were warmly greeted by professional and friendly staff and welcomed with Champagne and tasty Canapés. The station itself is something special as you get that luxury feel along with that historical elements of the old buildings almost taking you back in time. While we waited we popped into the Rovos Rail Museum which was just so fascinating to see how far Rovos has come. We were also fortunate enough to have had one of Rovos Rails first train drivers take us round and tell us stories of his train travels and guide us through all the history, the machinery and equipment that was once used. He also told us about the steam train on the platform at Rovos Rail called Tiffany which is still running and we were surprised to find out that it was actually built in Glasgow and was over 120 years old! The excitement was now high amongst travellers while eagerly waiting to board the train. 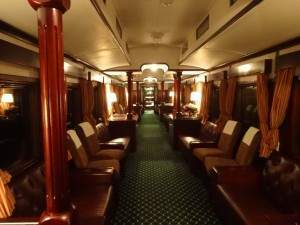 This was one of my highlights, our entrance to the train – it is something very unique and something that I will always remember as we walked down the carriages into our cabin, all lined with wood and rich fabrics which oozed a sense of elegance. From the first second we arrived and until we left we were given outstanding service by the staff and the food was exceptional with 4 courses being served at lunch and dinner with paired wines and delightful afternoon tea not to mention unlimited drinks on board. Once you in your luxurious cabin you can relax and enjoy watching the South African country sides pass you by with your windows down breathing in the air and looking out for the wild animals that you pass by or lying at night and gazing out to the stars was incredible. My other highlights was our excursions to Kimberley and Matjiesfontein. I have never had the chance to visit the diamond mines in Kimberley and we were pleasantly surprised to see what a world class venue this was and found this to be very interesting. We got picked up with air-conditioned busses from the station and we even had our own private guide throughout. On our last day we stopped at Matjiesfontein, a very old historic village with lovely museums and shops and a great little stop over before departing for the final few hours to Cape Town. We spent most of the time sitting on the open carriage at the end of the train enjoying beverages while watching the rugged rolling mountain ranges and wine farms pass us by with the sun beating down. Like I mentioned before, I am from South Africa, but I was blown away with what I saw and experienced and I will highly recommend this to anyone. I can honestly say that this was a trip that will stay with us forever! If this doesn’t tickle excitement like it did mine, I did learn that this trip was one of many train journeys that Rovos Rail does and with different Itineraries throughout the year. It’s just a matter of choosing which one suits you best! VIEW THE CHAKA TRAVEL ROVOS RAIL PACKAGES HERE!